Back in 2015, our Superintendent fell into the old Richmond trap of blaming the kids for the lousy performance of our schools. Well, to be fair, he just talked about the high rates of poverty, the large numbers of handicapped students, and our growing ESL population. His meaning was clear, however. To his credit, we haven’t heard much of that from him since then. 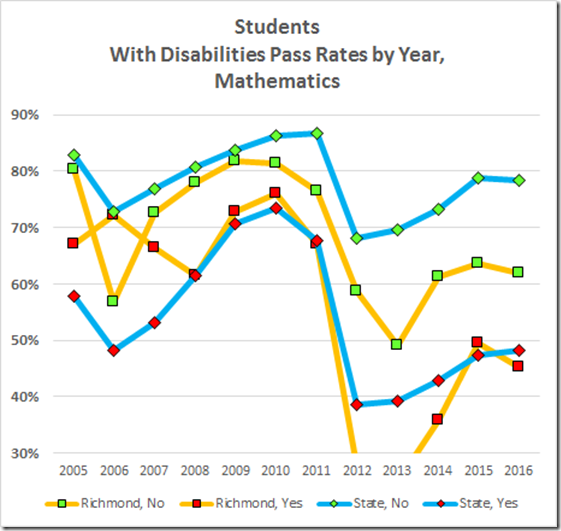 As part of my project to learn (altogether too slowly, I think) to use Excel to examine the performance of our schools, I have revisited data that support such restraint. 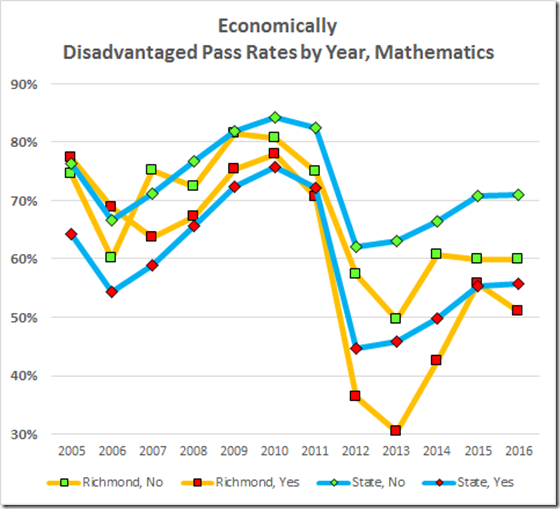 Let’s start with the pass rates of economically disadvantaged (“ED”) students in Richmond and statewide, compared with the non-ED population. 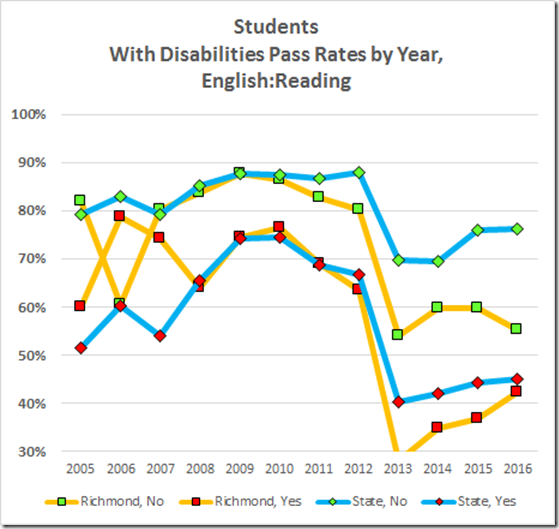 In these graphs, “No” indicates students who are not classified as economically disadvantaged, “Yes,” those who are. 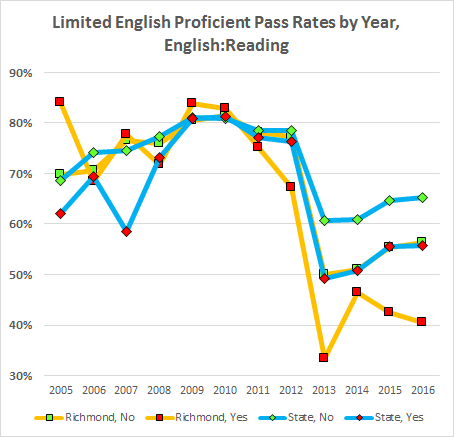 We know that standardized test scores decrease with increasing ED, so it’s no surprise to see the ED scores lower than the non-ED, both in Richmond and statewide. 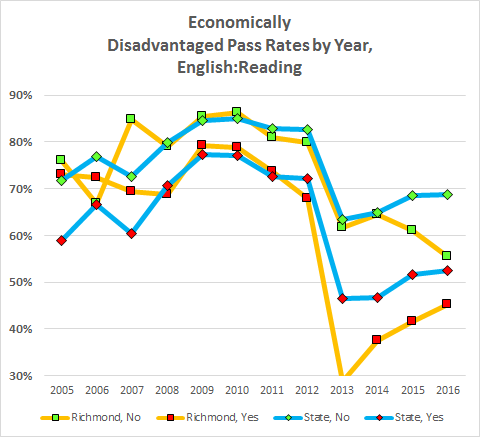 To the point here, Richmond’s economically disadvantaged students are underperforming their peers statewide. 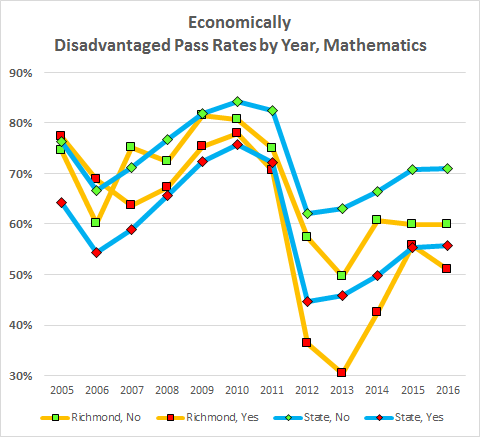 Likewise, our students who are not economically disadvantaged also are underperforming the state non-ED students. 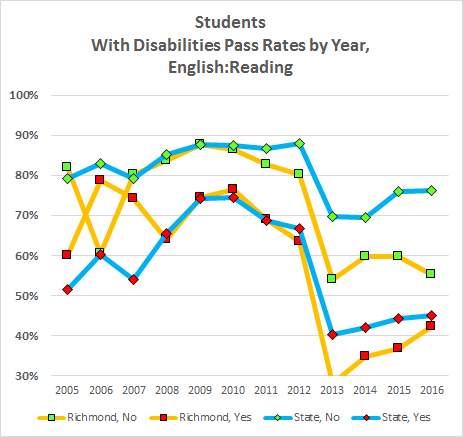 Next, the students with disabilities. Pretty much the same pattern. 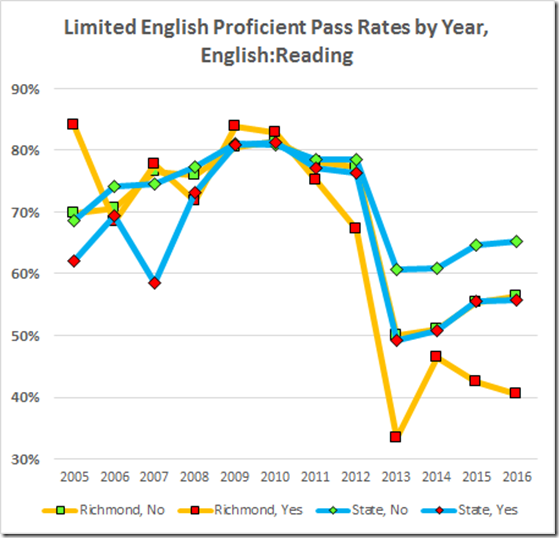 Last, the immigrant (search for “limited English proficient”) students. 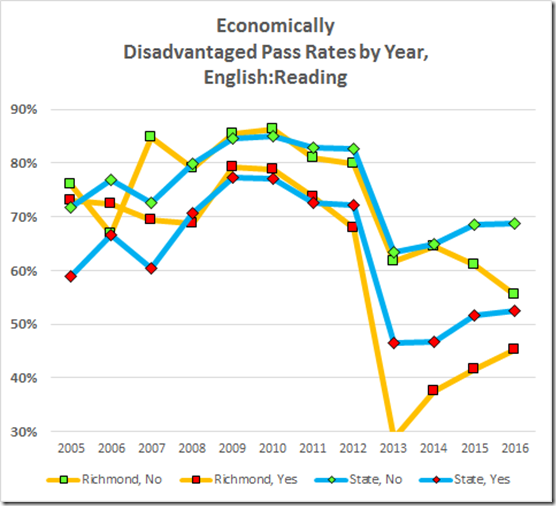 Without dwelling on the data on the pre-2012 tests (and Richmond’s wholesale cheating there), we can extract a clear message: Economically disadvantaged or not, disabled or not, immigrant or not, Richmond’s students are underperforming their Virginia peers. 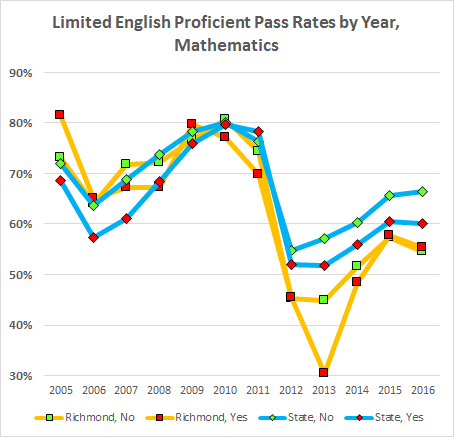 You can choose your explanation: Either there is a stupidity virus that infects children’s brains inside the city limits or Richmond’s children are being afflicted by a lousy school system. Actually, there’s only one explanation: That stupidity virus is the Richmond Public Schools.